1) Press and hold the pairing button with the ignition off. 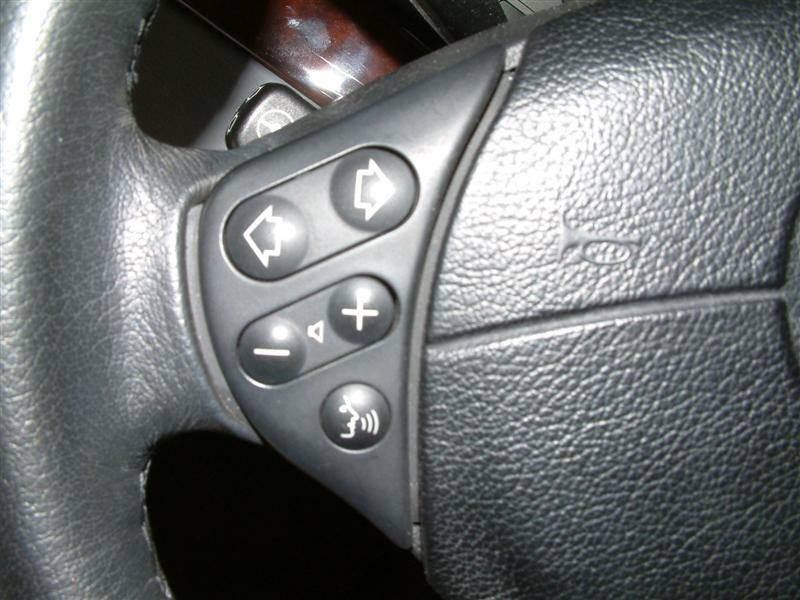 While holding the button turn the ignition to the accessory position, (first position), keep holding the button for an additional 3 seconds, and let go. The instrument cluster, radio or nav display will show the words Bluetooth Pairing. 2) Follow the instructions in the owners manual of your cellular phone to DISCOVER Bluetooth. Once the system is found use the Pairing Key code found on your ULF module part number sticker. Once the system and phone find each other the radio or nav display will say Pairing successful. At this time you can turn the key off, and using the phone's users guide set the phone to BLUETOOTH always ON, and not automatic. PLEASE NOTE the steering wheel button is NOT the pairing button, and does not support pairing of phones. The Bluetooth system allows you to navigate the phone book on your "High" instrument cluster (cluster pictured below with a line of text at the bottom), navigation display, MID, or Radio display, using the steering wheel buttons, radio controls or navigation controls. You can use the "FACE" button on your steering wheel to initiate voice recognition commands for phone voice tags, number dialing, notepad and navigation commands (if equipped). If your steering wheel does not have the face button, you can either use the pairing button to activate voice recognition commands or install the Range Rover steering wheel face button. Using the steering wheel controls or the radio controls, you can initiate voice commands, dial numbers from your phonebook, see call status or read SMS messages (ALL Phonebook and SMS features are phone dependant. The Bluetooth phone must support this Bluetooth profile to operate correctly). SMS is NOT supported at all on the first generation ULF module. We only use the latest ULF modules available as they support the features detailed below. You can use the R/T button to switch the Instrument Cluster display from up and down radio controls to phonebook controls, and use either the FACE button on the steering wheel (or pairing button) to initiate the voice recognition or navigation or phonebook dialing . Using the navigation controls you can dial from the phonebook of your Bluetooth phone, call up last dialed numbers, initiate voice commands, dial numbers from your phonebook, see call status or read SMS messages (ALL Phonebook and SMS features are phone dependant. The Bluetooth phone must support this Bluetooth profile to operate correctly) SMS is NOT supported at all on the first generation ULF module. We only use the latest ULF modules available as they support the features detailed below. Pressing the Emergency option will give you location details similar to the assist emergency functionality and allow you to make emergency calls with the current position information.